We are known as the leading manufacturer of an exclusive range of Forged Steel Block. 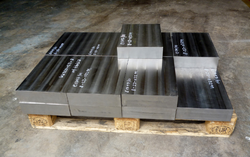 The Forged Steel Block are manufactured by using the best available raw materials and are available on a customised basis as per clients requirements. They are made by using steel and are offered to clients at very reasonable price.